These return numbers are absolutely mind-blowing over a 20-year time horizon. 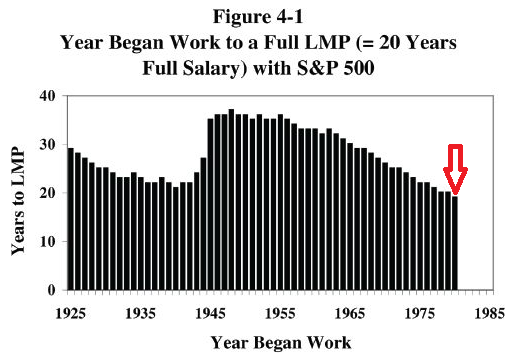 I’ve highlighted the 1980 value on the graph for a reason. 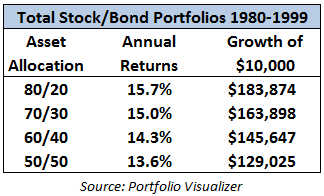 If someone beginning their career in 1980 would have stocked away 20% of their income in the S&P 500 it would have taken them just 19 years to accumulate enough to money to retire. However, someone starting in 1948 would have had to save and invest for 37 years to hit their LMP. Looking at the unbelievable returns you would assume that nearly all baby boomers should have saved enough to retire early, right? Not exactly as the Employee Benefits Research Institute estimates that almost half of all baby boomers are at risk of not having enough money to pay for basic needs in retirement. 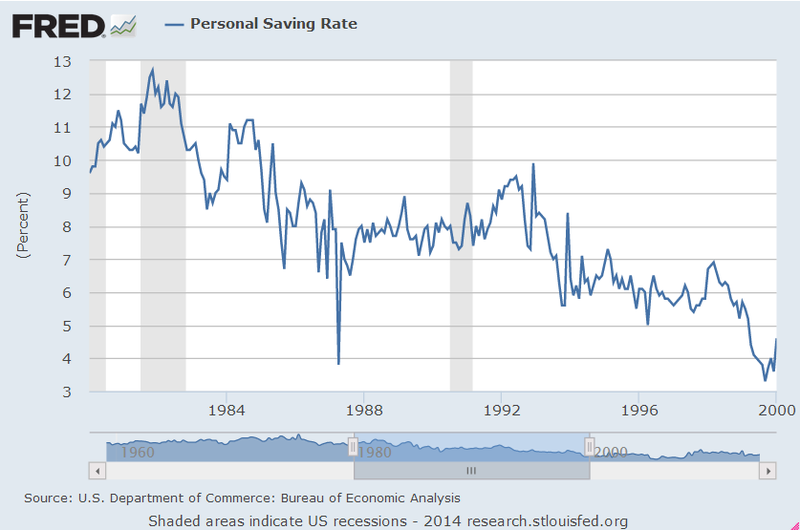 After spending the majority of the early 80s in the double digits, the savings rate collapsed to just over 3% by the beginning of 1999. Investors extrapolated the sky-high returns over this two decade stretch and assumed they didn’t need to save as much. Once the party ended with two market crashes over the subsequent decade many investors realized they were reliant on ever higher market prices to fill the gap in their reduced savings rate. When that didn’t happen, people were in trouble with their retirement savings. The lesson here is that investors can’t rely solely on market performance to build a retirement portfolio. The best way to build a nest egg is to prudently save money first and then compound those savings through the financial markets. Also, the good times don’t last forever as the markets tend to move in cycles. And while the returns from that period were a thing of beauty, investors can’t rely on higher than average returns to meet their future needs. Interesting. Even though returns were sky high throughout those two decades, savings rate still decreased over that time frame. You would think that based on investor mentality, higher returns would draw more capital into the market, similar with what’s happening now with investors piling into stocks after a few years of above average returns. Perhaps investors assumed double digit returns were the new norm and realized they did not need to save as much to achieve their retirement goals. If we go on another run like this, hopefully investors will continue to increase their savings, not decrease. It can be difficult for investors to not extrapolate the recent past, especially when those good returns lasted for so long. I agree, hopefully the fact that the 2000s weren’t great for returns that people jack up those rates and continue to save. What effect did the high inflation and interest rates have on market returns and savings rates during that time? And does savings mean investing in the stock market, or putting money into a savings account, or both? I imagine that had something to do with the declining savings rate. It was double digits right up until the 80s. Higher rates could have had something to do with it but the PSR is defined as the % of money leftover after your disposable income has been spent. it would be both types of accounts (so very low) although obviously this doesn’t account for the growth in those accounts. The fact that debt was much easier to take on also had an impact since people just borrowed their way to prosperity.